A metered dose Beclomethasone Dipropionate Aerosol for oral inhalation. Each puff from the canister delivers 50, 100 & 250 mcg of micronized Beclomethasone Dipropionate.This product contains HFA 134a as propellant. Beclomethasone inhibits mucus secretion in airways, by a direct action on submucosal gland cells and an indirect inhibitory effect caused by the reduction in inflammatory mediators. 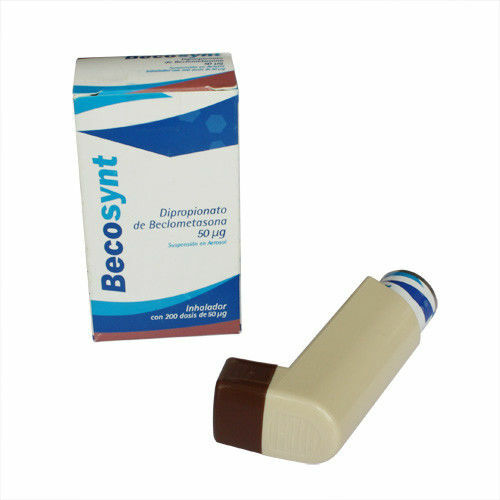 Beclomethasone 50mcg Inhaler is indicated in the prophylactic therapy for patients 5 years of age and older with persistent symptoms of mild to moderate chronic bronchial asthma. Beclomethasone 100mcg and 250mcg Inhalers are indicated in the prophylactic therapy for adult patients with persistent symptoms of severe chronic bronchial asthma.